Tours run every day at 9:30 a.m. and 1:00 p.m. all year round. Minimum age to participate is 8 years. Guides take a maximum of 14 people per group. 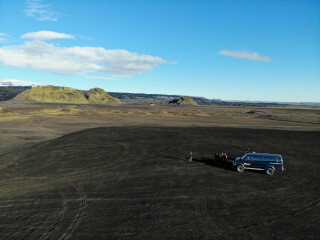 Driving time to meeting point is about 2.5 hours from Reykjavik. What to bring? Warm clothes (outer layer), a waterproof outer layer, gloves, a hat, hiking boots, and water. 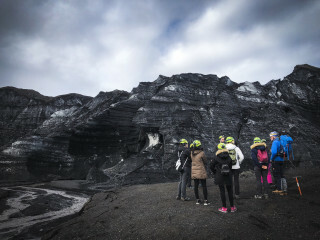 It's not every day you can explore caves, a glacier, and a volcano all in one. 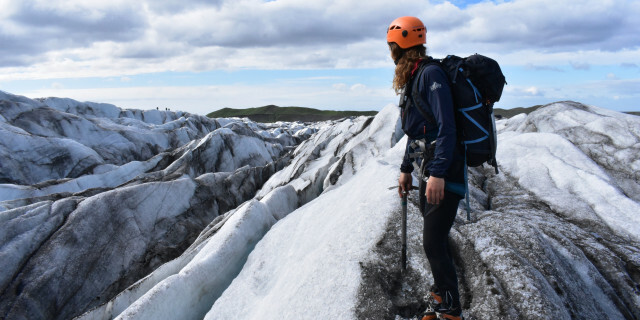 Hop into a Super Jeep, put on your crampons, and enter the mighty Myrdalsjokull Glacier. 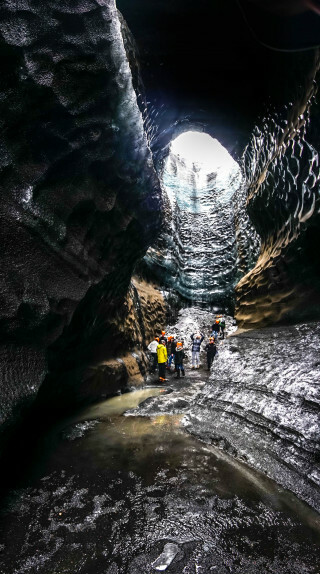 In this off-the-beaten-path tour to a natural ice cave underneath Katla volcano, you’ll admire the surroundings and glaciers the South Coast of Iceland is so famous for and then enter inside. 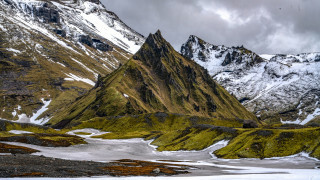 After meeting your guide in the southern town of Vík, you climb aboard a Super Jeep to take a ride on a rugged road through the green hilly landscape. 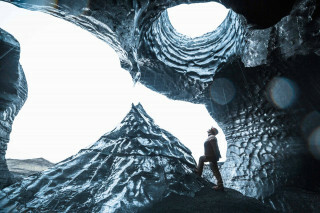 When you arrive at the cave, located under the Kotlujokull glacier, you immediately notice the volcanic features. 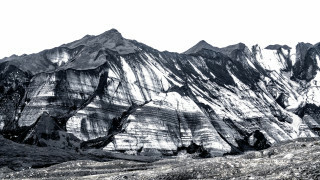 Jagged peaks of black volcanic ash towers above you. Among this dark hillside is the entrance to the cave. Put on your gear from the guide and step inside. 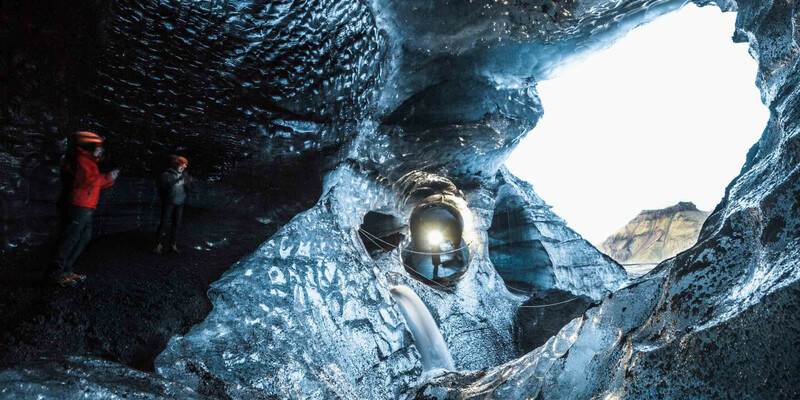 The views all around the Ice Cave are nothing short of spectacular. With an artful combination of the colors, marvel the dark black ice mix intricately with the blue ice. 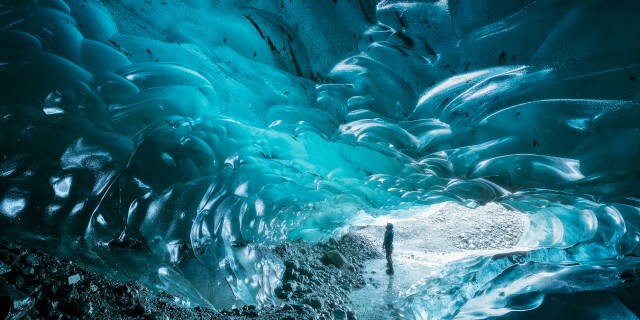 Underneath this glacier, there's also a mighty active volcano. 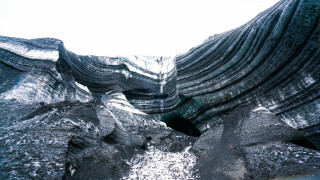 The Katla volcano's previous eruptions have given the cave it's dark ashy touch. 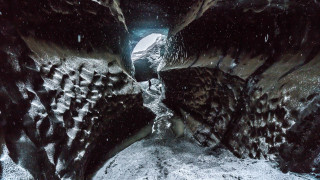 Ice caves are not common in the world, so you can explore a real natural phenomenon. 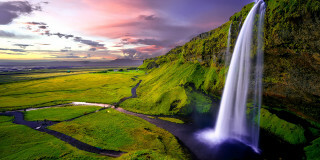 Enter Iceland's frozen wonderland and become mesmerized by the maze of icy paths. 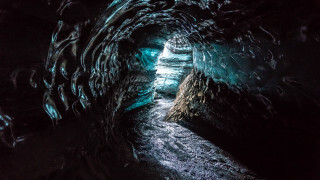 The caves hiding under the Katla volcano are truly a new level of glacier exploration.